*	pay for any extra needs. Registration fees to attend Global Dialogue 2006 are free. Even though there are no registration fees, registration to the Global Dialogue will be required. If you are planning to participate by coming to the site, please register now through the email and finalize your registration at the site. If you participate through the Internet only you still have to register by email. The following two photos show the geographical place of the Workshop Session, in Nanaimo, British Columbia, Canada. Please take a look at the Proposed framework for Workshop Sessions, Opening and Closing Ceremonies. The Place of Global Dialogue in Nanaimo, the physical site, will be in given later. Nanaimo Airport is located just 15 minutes south of downtown and serves an average of 20 flights daily between Nanaimo and Vancouver, Abbotsford and Langley. An airport shuttle service, taxis, and car rentals are available at the airport. BC Ferries operates a scheduled ferry service between Departure Bay in Nanaimo and Horseshoe Bay on the north shore of Vancouver, and from Duke Point in Nanaimo to the Tsawwassen Ferry Terminal, south of Vancouver. Regular ferry services are available from downtown Nanaimo to nearby Gabriola Island and Newcastle Island in Nanaimo Harbour. From Vancouver to Nanaimo (Tsawwassen - Duke Point), the crossing time is approx. 2 hours with 8 round trips daily. From Vancouver to Nanaimo (Horseshoe Bay - Departure Bay) the crossing is 90 minutes for the conventional ferries and one hour for the PacifiCats, with sailings every two hours and extra sailings in the summer. The 'PacifiCats' are the latest addition to BC Ferries' fleet - amazing, high-speed catamarans carrying up to 250 vehicles and 1,000 passengers. They also feature two passenger decks with floor-to-ceiling windows, a cafeteria, and a children's play area. Complete schedule and fare information for all BC Ferries is available on-line at BC Ferries Web Site. To get to Nanaimo by car from Victoria, take highway 1. Nanaimo is 111 Kilometres or 69 miles from Victoria. Allow at least 1.75 hours to get there. Island Coach Lines provides scheduled motorcoach service throughout Vancouver Island. For schedules and information, call (250) 385-4411. Laidlaw Transit also provides schedule bus service throughout Vancouver Island. Call (250) 388-5248 for more information. Famous for its varied landscapes and more than two dozen parks, the city of Nanaimo promotes one of the nicest waterfronts in Canada, conveniently located to serve as a home base for exploring Vancouver Island. Nanaimo, with a population of 77,583 people, is the only all-purpose port city on Vancouver Island, with every facility required to serve both the commercial and recreational needs of business and tourism. Once the location of five separate native villages, its name derives from a Coast Salish word, Sney-ny-mo, the "meeting place" - a perfect description of the rapidly-growing harbour community at the centre of Vancouver Island's highway and ferry system. A playground of land and sea activities, Nanaimo is a perfect place for a family vacation, a year-round golf getaway, or a romantic weekend. No matter what your business, Nanaimo offers the perfect mix of work and play. With its pristine beauty, the incredible array of adventures and activities available, the city is the ideal destination for conventions and meetings. There are over 1,000 rooms available in the city, with several major hotel and motel chains. The Universal Currency Converter, the world's most popular currency tool, allows you to perform interactive foreign exchange rate calculations on the Internet, using live, up-to-the-minute currency rates. Before planning your visit, see how far your money will go when converted to Canadian dollars by using the conversion tool, the Universal Currency Converter service and trade mark under license from xe.com. The Goods and Services Tax (GST) is a seven per cent (7 %) tax that is charged on most goods and services sold or provided in Canada. Foreign visitors to Canada can apply for a rebate on the GST that is paid on accom-modation (up to 30 nights per visit), and on goods purchased in Canada and exported within 60 days of the purchase. The provincial tax is seven and a half percent (71/2 %). The foreign-based convention organizer also has another option. If the attendance at his or her convention is at least 75 per cent non-Canadian, he or she can claim a rebate for tax paid on exhibition space and convention supplies (including business equipment rental, security, audiovisual equipment and speakers). If you’re planning a meeting, trade show or convention in Nanaimo, you’re advised to contact both Canada Customs and Revenue Agency well in advance (three to six months is suggested). All the ins and outs of the GST will be explained to you in detail, and all the procedures set in motion. To obtain more information and request a copy of GST: Information for Travel Agencies, Tour Operators or Convention Organizers. Nanaimo Airport is located just 15 minutes south of downtown and serves an average of 20 flights daily between Nanaimo and Vancouver, Abbotsford and Langley. An airport shuttle service, taxis, and car rentals are available at the airport. You can also opt to fly into Nanaimo harbour's seaplane terminal in the heart of downtown. Service is frequent and offers spectacular scenery en route. Contact a travel agency for an airfare estimate. View the Current Weather at Nanaimo Airport. One of the best ways to achieve big savings on international flights is by using the web to get the best deal. The following are some tips to keep in mind when you book your international flight. Many airlines will slash an additional 10 percent off international ticket prices for customers who purchase tickets on the Web. One way to keep track of last-minute sales is by signing up for e-mail alerts from airlines with major hubs in your area or checking out internet sites for cheap travel. Consolidators have some of the lowest fares around, but be careful - international tickets from consolidators have a lot more restrictions, including travel dates. Packages: Savings on all-in-one vacations. Fly off-peak days and hours. Traveling off-peak days such as Saturday or Tuesday through Thursday and buying your tickets in advance can help land you the lowest fares on international flights. Also, try to avoid the peak hours by looking for flights departing either before 7 AM or after 7 PM. Ask about taxes and fees. Make sure the international ticket price you are quoted includes taxes and fees, which can bump up a fare price by $100 or more. Some ads for low fares dont include taxes and fees so be sure to ask your travel agent and, as in everything, always read the fine print. Be flexible with your dates and times. Folks with flexible travel dates and international destinations often scoop up the best bargains. If you have a fixed travel schedule and a fixed destination you may have a tougher time landing the best travel bargains. To get the lowest deal possible, be sure to check prices on flights from multiple airports in your area. Check out package deals. A package deal might give you international airline tickets, hotel accommodations and a rental car for your destination at an unbelievably low price. Or it might not. Be sure to compare package deals with prices you could get on your own. Make an international connection. If your travels take you abroad, you can often save by connecting through an international gateway like Paris or Amsterdam. It is a good idea to add an extra day into your trip, because you may need to connect between airports. Remember that miles really work. Youre throwing away money if you dont consider how many frequent flier miles youll earn on your trip. If youre flying domestically on some major airlines, for example, not only can you sometimes get a fare for under $200, but you can often earn triple miles if you are signed up with the airlines frequent flier plan. Thats more than halfway to a free domestic award with just one ticket. The Nanaimo Airport @ Cassidy, located approximately 18 km south of downtown Nanaimo, is the primary air transportation gateway for the central Vancouver Island area. The Nanaimo Air Terminal, constructed in 1991, is a modern air passenger facility supporting a broad range of services and amenities including scheduled and charter airlines, car rental agencies, ground transportation companies and a restaurant. The air terminal complex also includes short-term and long-term parking. The Nanaimo Air Terminal handles an average of 120,000 passengers and an estimated 650 tonnes of air cargo and freight annually. The current flight schedule offers 7 flights daily to Vancouver International Airport. Jazz Air Inc operates for Air Canada with a Dehavilland Dash 8 - 100, comfortably seating 37 passengers or a 50 seat Dash 8 - 300. To reach a member of the Board of Directors for the Nanaimo Airport Commission, please direct your message to Airport Management, who will insure it goes to the appropriate Committee or Chairman. Average $35 - 55 per day for three moderately-priced meals. 2) The City of Nanaimo's Web Site. The site is now organized for Residents, Business, and for Visitors to make finding information easier and faster. 3) You also have quick access to CityMap (Nanaimo's one-of-a-kind GIS interactive mapping application). City Hall (Council, Council Committees, Bylaws), the City Directory (a complete, searchable list of City Contacts), and City Departments (an organization chart linked to our City Directory). Visitors may connect on a short flight (15 minutes) from Vancouver International Airport or (45 minutes) from SEATAC (Seattle, Washington) to Nanaimo Airport located about 10 minutes drive from Downtown Nanaimo. Regularly scheduled float plane flights (Baxter Aviation and Harbour Air) connect Downtown Nanaimo with Downtown Vancouver (20 minutes). Amigo Airways flies from Nanaimo Harbour to Vancouver International Airport 4 - 6 times daily. Float plane service direct from Seattle, Washington is also offered by Kenmore Air. Canadian Western Airlines offers daily chartered airline service between Nanaimo Airport and SeaTac Airport. E & N Railway provides daily passenger service connecting Downtown Nanaimo with Courtenay/Comox in the north and Victoria in the south. BC Ferry Corporation provides hourly passenger and vehicle service to Departure Bay and Duke Point terminals in Nanaimo (2 minutes and 10 minutes respectively from Downtown) from Vancouver's Tsawwassen and Horseshoe Bay terminals. HarbourLynx began in 2003, whisking passengers to and from downtown Vancouver and downtown Nanaimo in approximately 75 minutes. The Vancouver Island Highway connects Downtown Nanaimo with Victoria (90 minutes to the south and with Campbell River (90 minutes to the north). Whether you choose to travel by highway or back road, Downtown Nanaimo is easy to reach from anywhere on Vancouver Island. Car rental, bus & taxi services are convenient in the downtown area. The Vancouver International Airport is an excellent performing airport in Canada. From the airport you can communite by charter flights to Nanaimo, British Columbia. Avis and Hertz car rental offices at the Airport. We may have a Tour organized during the Global Dialogue. We will do our best to help you but we have no funds to help you financially or to help you in getting here other than helping you in getting the information you need to participate in the global dialogue. Our help to you is restrained to information gathering to participate in the global dialogue.. It is the Mount Benson Preservation Society social responsibility to ensure safety, maintain health and preserve environment. We consider that a way to fulfill this responsibility is to open a citizen's understanding on environment through enlightenment and education, and steadily attain public confidence through positive communication with local and global communities. The Society contributes to the enrichment of regional culture through its involvement in a variety of cultural activities. We can arrive at an optimized solution for coexistence of nature and the Global Community through scientific research in all fields relevant to this question. We promote research on the local and global environment and its preservation, general practical researches to maintain a stable relation between human activities and nature. Preservation and conservation often go hand in hand when it comes to helping the natural environment to remain healthy or become healthier. Related efforts in restoration are aimed at helping the environment recover from destruction caused by human activity. The Mount Benson Preservation Society aims to preserve, conserve, and restore native habitats, plant and animal species, and other elements of the region's natural environment. Wildlife conservation and rehabilitation takes many forms in the Regional District of Nanaimo. Wildlife rehabilitators perform an invaluable service to the survival, preservation, and restoration of region's wildlife. Their primary mission is to take in injured and orphaned animals and care for them until they can be returned to the wild. Encounters with automobiles, pesticide poisonings (from both agricultural and lawn-care products), and attacks from dogs and cats are the most common causes for injuries and illness. The Mount Benson Preservation Society is implementing a reforestation project, which is designed to preserve the biodiversity of this region, while enhancing its landscape and helping control its climate, protecting wildlife and the green belt surrounding in and around Mount Benson. Ever since December 2002, the Society has started a campaign to reclaim Westwood Ridge and Mount Benson. (see section 'Projects' for Petition). The Society is conducting fund rasings to purchase the properties from owners. You have to make your own flight arrangements. You make your own arrangements. Please use the map of the City to make your own selection of a Bed and Breakfast place. When planning to stay in a B&B it is almost essential to make reservations ahead. This Is especially important on weekends and holidays. Many hosts have just 1 to 3 rooms while others accept only advance reservations so they can plan around other family and social events. If you are calling a host, rather than a reservation service, avoid calling before 10am as breakfast is usually in progress. The time you call for the reservation is the best time to make your travel needs, accommodation interests and breakfast desires clear. Allergies to down pillows, a need for extra blankets, or beds for very tall people should be discussed at that time. Inform your host or reservation service of specific health problems, concerns about stairs or special dietary needs. Check-in time is usually between 5 and 7 PM. If you need to make different arrangements, make sure you ask ahead - the host may be asleep or not even be home when you arrive! Hosts enjoy personally greeting their guests and make a point of being there as they enter the premises. Check-out time is usually by 11a.m. although it may be earlier on weekdays if the host has another job. It’s important to inquire about check-in and check-out times when you make your reservation. The time between your departure and the arrival of the next evenings' guests is required to clean the home well -- much like you do when you are expecting new guests at your home. Hosts must also do their next day’s grocery shopping, bookkeeping, sewing, minor repairs, etc. during this time -- they don't usually have employees to attend to these necessities. It’s a good idea to ask your hosts in advance for sightseeing ideas' restaurants and so on. They are usually aware of the best around! Let them know the types of hobbies, sports, or food you enjoy, and you'll be surprised how helpful a host can be! Most B&B hosts thrive on providing special touches that hotels just can't do. Don't be shy when you book, you’ll enjoy getting to know your host and it will help you enjoy your stay too! Vancouver Island.com will help you find Accomodation: Hotels, Motels & Inns, Hostels, Bed and Breakfasts, Resorts, Spas & Lodges, Cottages, Cabins, Suites & Condos, Fishing Lodges, Fishing Camps, Guest Ranches, Health Ranches, Ski Resorts, and Vacation Homes. Please use the map of the City to make your own selection of a Hotel. Registrants requesting accessible accommodations please let the Hotel Manager know in advance. Any PERSONAL SERVICE requirements may be made when you reserve your room. Many rooms have extra beds and can accommodate four or even more persons. Some suites have kitchenettes. Hotel rooms will have different prices depending on size and other factors. It may be more economical to rent a room with other people. When you stay at a hotel are you always paying for services you don’t use or always looking for services they don’t have? A little research and planning can help you find the right room in the Hotel that best suits your needs. We can help you become an informed traveler and help you find that room so you can enjoy a safe, healthy and economical stay. Ask around and consider their customer service record. What ratings have they received from independent rating organizations? Evaluate their hotel for consistency. Many Hotels have several locations so you’ll want to see how the particular location fits into the Hotels chain. Find out how the chain rates this particular property within their organization. # Consider their Hotel policies, are they favorable to you or do they penalize you in some way. # Find out what partnerships they have that could save you money in other areas. Many Hotels have agreements with airlines, rental car or credit card companies. Book a hotel with these perks and save extra. # See if they credit your frequent guest programs with points. # Check the hotel locations. Does their chain have locations where you travel? Do they have locations across seas? # Check the individual hotels location. Is their airport hotel really close to the airport? # Evaluate their facility. When were the rooms last remodeled? Does it have the types of features you need? How well does it suit your need for the quick overnight stay or the weeklong resort vacation? Do they have business suites or meeting rooms available if you need them? Does the particular Hotel you want to stay in located in a safe part of town? Is any major construction going on in the area around your Hotels location? Will there be any large groups staying at the Hotel that could negatively impact your stay? # Do they offer the types of extra services you need? Do they have a concierge, shuttle or laundry service? # Can they honor your special requests? # See if they offer a Premium or Loyalty Club that feature the services you need. # Check to see if you belong to any groups that entitle you to a special deal with a particular Hotel. # Consider their rates and the availability of any coupons or discounts. See who offers the best overall deal for your budget. Award winning Motor Inn on Long Lake in Nanaimo, near the two largest shopping malls on Vancouver Island. All lakeside rooms with balcony, fridges, coffeemakers, hairdryers, iron & boards, VCR-TV, and more. Indoor whirlpool, sauna, fitness center, beautifully landscaped grounds, reasonable rates with free continental breakfast. High Speed Internet Access available in all guest rooms and meeting rooms. Enjoy High speed internet access in lobby kiosk, fantastic location across the street from Woodgrove Centre, Vancouver Island's largest shopping mall. Specialty Restaurant and Friendly Neighborhood Pub, Sauna and Hot Tub. All Rooms with Microwave Oven, Refrigerator, Coffee/Tea Maker with supplies, 25" TV with expanded cable and pay-for-view movies, Irons and Board, Hairdryer, Queen Size or Larger Beds, and Air-conditioning. Near BC Ferry terminals, downtown, closest hotel to Nanaimo Airport. 79 newly renovated Air-Conditioned units including deluxe business suites, kitchenettes and kids fun suites, some with ocean view. Indoor swimming pool, hot tub, coin-laundry, Cable TV, in-room coffee. Free newspapers and parking. ABC Country Restaurant, Banquet and Conference facilities. Nanaimo is among British Columbia's most liveable cities, having a favorable balance of lifestyle, employment and investment opportunities. Centrally located on the east coast of Vancouver Island, 111 km north of Victoria and 34 km west of Vancouver, Nanaimo is a regional service center for mid and north Vancouver Island. This growing community (77,000 population with a 4% growth rate) enjoys a skilled and educated labour force (home to Malaspina University-College, 10,000 students), an impressive infrastructure network and many nearby recreational and cultural amenities. Nanaimo is an excellent place to live, work and do business. All this in the friendliest climate in Canada, in a spectacular oceanside setting, surrounded by some of the most beautiful wilderness in the world. Nanaimo's trendy restaurants, boat tours, diverse arts performances, unique walking tours, art galleries and shops entertain locals and visitors. Other activities include golf, tennis, diving, fresh and saltwater sport fishing, sailing, kayaking, beach combing, rock climbing, camping, caving, wildlife watching, hiking, biking, bungy jumping, swimming and snorkeling with the seals - the list is endless. And if that isn't enough, Nanaimo is less than 90 minutes away from world-class Alpine and Nordic skiing. 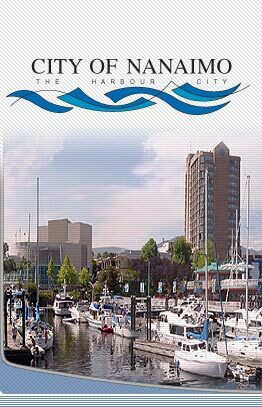 Welcome to the City of Nanaimo's new Web Site. The site is now organized for Residents, Business, and for Visitors to make finding information easier and faster. You also have quick access to CityMap (Nanaimo's one-of-a-kind GIS interactive mapping application). City Hall (Council, Council Committees, Bylaws), the City Directory (a complete, searchable list of City Contacts), and City Departments (an organization chart linked to our City Directory). The Downtown Nanaimo Information Centre provides a wide range of information on downtown events, business and residential opportunities, shopping and dining, current events, visitor attractions, Downtown Nanaimo Partnership and business association information, community and development services, maps, heritage information, business and local tourism information. In 1999 the Downtown Nanaimo Information Centre (DNIC) was created as "a place to meet and find out what is going on in Downtown Nanaimo in a dynamic, fun and interactive way." Its primary focus was to be "on advertising the business, cultural and artistic activities happening in Downtown Nanaimo." Its long term vision was "to be a key ingredient in creating a revitalized and sustainable downtown community." During the first three years, DNIC has shown and provided for a significant need for information services. During the summer, our staff and volunteers provide information for as many as 2,000 visitors per month. On an on-going basis the Information Centre helps anyone find whatever they seek in Downtown Nanaimo, from investors looking for business locations or development opportunities, to foreign tourists looking for the best places to eat. Please email us with any questions, our address is info@nanaimodowntown.com. During the summer, see the artifacts and exhibits at the Bastion, a fortified tower erected on the waterfront in 1853. The Bastion is the oldest remaining structure of its type in North America, and is one of the few Hudson's Bay Company bastions still standing. You can watch the cannon-firing ceremony every day at noon in summer, complete with Scottish bagpipes and Highland dancing. Nanaimo treasures a number of Historic Buildings, including The Miner's Cottage (1897) in Piper's Park adjacent to the Nanaimo District Museum, the Nanaimo Courthouse (1896), the brick-faced Earl Block (1888-1890), and the Palace Hotel (1889). A 72-million-year-old palm tree fossil - the biggest fossil leaf ever found in Canada - was discovered in Nanaimo in August 1996. Salvage palaeontology of the site revealed exquisitely preserved specimens of the Upper Cretaceous Period, including dawn redwood, several fern species and many angiosperms. Unfortunately, most of the remaining fossil-containing rock has been excavated, crushed, and used as road fill for the Duke Point Road extension to the Duke Point Ferry Terminal. The Nanaimo District Museum at 100 Cameron Road displays interesting exhibits covering the history of the region, archeological artifacts, and 10,000-year-old petroglyphs. Among the displays are a replica of a Chinatown street and a replica of a coal mine, complete with visual and audio effects. The Nanaimo Art Gallery at the Malaspina University-College provides a wonderful panorama of the city. The gallery enlivens and enriches the Nanaimo and central Vancouver Island region with exhibitions and educational programming that encourage active public involvement with the visual arts. The Gallery also maintains Nanaimo's Permanent Collection of ninety-four works by local and international artists. Each spring the Festival of Banners has area artists creating a gallery of original street banners that are displayed on lamp standards throughout Nanaimo. Bring the family to the fun-filled Bowen Park recreation park, which features a scenic waterfall, a nature centre, a children's barnyard, duck pond, swimming and wading pools, hiking trails and more. Beban Park, Nanaimo's premier recreation centre offers activities for everyone including swimming, skating, tennis, playgrounds, basketball, golf, lawn bowling, multi-use trails, and playing fields. The Scotch Bakery on Commercial Street is the home of the Nanaimo Bar, a regional specialty that is actually a form of chocolate fridgecake. No picnic or visit to the Nanaimo Waterfront would be complete without one. Head up the hill to Nanaimo's Old City Quarter, off Bastion Street, to sample coffee bars, restaurants, several specialty boutiques, a delightful outdoor art gallery, an international specialty food store and home-decorating emporia. Browse through the antique stores and tour the historic railway station. The Quarter is a charming blend of heritage and new architecture designed to fit seamlessly into the historical ambiance of the area. The flagship of Nanaimo's burgeoning arts and culture scene is undoubtedly the Port Theatre located in the heart of downtown. The Port Theatre, an 800-seat state of the art performing arts theatre opened in 1998, is host to international, national and local talent. An arts tour in Nanaimo might include First Nation's galleries, the contemporary art gallery at Malaspina University College, Art 10, the Arts Council gallery and private galleries scattered throughout the surrounding area. Nanaimo is home to potters, weavers and doll makers and to one of only three Tozan wood-fired kilns in the world. The four-kilometer Harbourside Walkway extends from the downtown harbour, past the modern seaplane terminal, through Swy-A-Lana Lagoon Park (Canada's only man-made tidal lagoon), over the new pedestrian bridge, by the Nanaimo Yacht Club, and as far as the BC Ferries Terminal. The promenade is dotted with vibrant art galleries featuring First Nations and Canadian crafts and great restaurants. Visitors won't want to miss the world-famous Bathtub Race between Nanaimo and Kitsilano Beach, held during the Nanaimo Marine Festival each July! Nanaimo also hosts the annual Cadillac Van Isle 360 Yacht Race. This two-week, 580-nautical-mile race around Vancouver Island begins and ends in Nanaimo. Beaches: Departure Bay offers great lengths of public beach on the town shoreline. Pick a location that appeals to you, park in one of the many access points, and stroll out onto the hard-packed sand. Also on the Nanaimo waterfront are Maffeo Sutton Park and Swyalana Lagoon Park. Although these two aren't in the same league as some of the larger stretches of waterfront farther north, they do provide convenient beach and picnicking locations on Nanaimo's sheltered inner harbour, and are beside a seawall walking, cycling and in-line skating route. Nanaimo is an ideal base for boaters wishing to explore the scenic Gulf Islands and surrounding areas. Charter and bare-boat rentals and guided tours are available. The Trans-Canada Highway 1 leaves Vancouver Island at the Departure Bay Ferry Terminal, commencing its journey across Canada from the Horseshoe Bay Ferry Terminal north of Vancouver. The 4,849-mile (7,821-km) Trans-Canada is Canada's mythic highway, starting (technically) at Mile 0 in St. John's, Newfoundland, and ending in Victoria, British Columbia (also Mile 0). Nanaimo and the areas to the north have seen the proliferation of golf courses with a view. Tee off on any of 20 golf courses within an hour's drive of Nanaimo. Courses range from family mini-golf to demanding 18-hole courses with beautiful views. Located in Nanaimo is the Nanaimo Golf Club, 3 miles (5 km) north of the city, a demanding 18-hole course with beautiful views of the water, and two 9-hole courses; Pryde Vista Golf Club and the Eaglequest Golf Centre.